Double your "dynamic" fun! This is the rare DF Exclusive Edition of True Blood: Tainted #2 and now it's signed by both True Blood actor and the issue co-writer, Michael McMillian and co-writer Marc Andreyko! Another awesome DF Exclusive edition of the smash hit True Blood series! The latest head-turning story arc of the True Blood comic series starts here and it's signed by both Michael McMillian who plays Fellowship of the Sun leader Reverend Steve Newlin on the HBO series True Blood, is co-writing this new story arc of the second series comic adaptation. And co-writer Marc Andreyko! "Tainted, Our friends in Bon Temps just can't seem to catch a break these days. Sookie Stackhouse's world is turned upside down when contaminated bottles of Tru Blood cause the Southern Vampire population to go berserk! Looks like those growing human/vampire tensions aren't going to simmer down anytime soon! But who (or what) is behind the bad "Blood"? And Hoyt plans to do what for Jessica?! 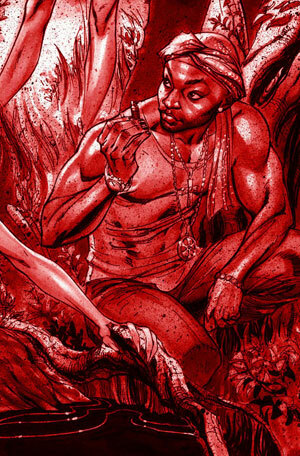 The latest "head-turning" story arc of the True Blood comic series starts here!